Life without parole is usually associated with a prison sentence and when we think of that, the image of a convicted criminal locked in a small cell behind bars for the rest of his or her life immediately comes to mind. What we usually don’t think about is the very small number of people who are chosen for or who choose to accept this type of a sentence and the very limited options that they have. 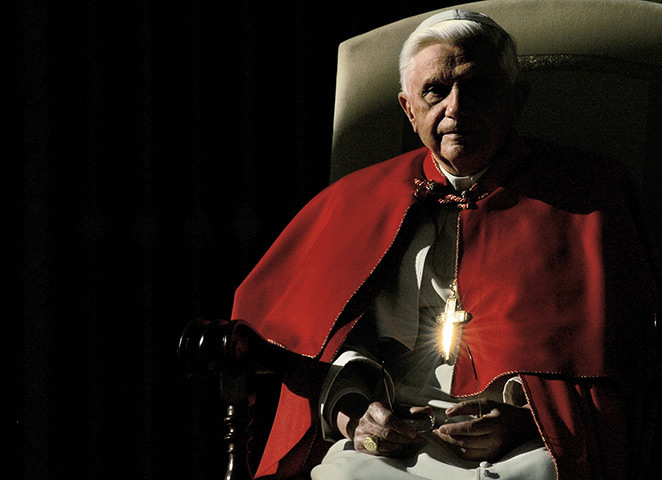 The recent decision by Pope Benedict XVI to resign his position as the Supreme Pontiff of the Roman Catholic Church made me think about just what it must have cost him to take on that role and again what it will cost him personally to set that role aside. When a Pope is chosen by (and from among) the College of Cardinals, each is asked the same question by the Supreme Elector of the Church: “Do you accept election?”. In the life of a person who is destined to become the Pope, that question and the answer that follows it will be the single most important decision that the individual will likely ever make. Of course, any candidate for such a unique and influential position knows when they enter the conclave what their answer would likely be if they are chosen but I’m sure it feels very different when your electors are standing there in front of you actually asking that question. What they should be asking the candidate is more like this: Do you accept that for the rest of your natural life, you will become the head of the largest Christian church in the world, responsible for the message, the outreach and the mission of the Church and countries in which this church exists; that you will be acknowledged to be the absolute final word on anything related to church doctrine and belief; that your life, in addition to belonging to God will now also belong to billions of people who will look to you for leadership and that the only escape from this will be your death? No single question asked to any individual will likely ever carry that kind of weight and responsibility. To the man who accepts it, he has just accepted a prison sentence that, but for an act of desperate measures, will be with him for the rest of his days. To be sure, the Pope lives in the religious equivalent of a castle; he has attendants and assistants that help him with every need and who manage nearly every minute of his life. He wants for nothing in the material way, yet he has just given himself to pretty much every person, even those who are not of the Catholic or even the Christian faith because he is still looked to for leadership and guidance by so many. Very few in the world can truly understand the burden that holding a position of such importance carries with it but there are a handful. Queen Elizabeth II of Great Britain, who at 86 years old is only a year older than Pope Benedict, is one such example. When she ascended to the throne of the United Kingdom in 1952, she was only 26 years old and since that day forward she has carried the burden of wearing the crown for the most important monarchy in the world. Like the Pope, she carries the additional burden of being the head of the Church of England, which includes the Episcopal Church here in the United States. She wasn’t born to be the Queen but she had little choice in the matter when the abdication of her uncle, King Edward VIII, forced her father to become the King, putting her directly in the line of succession. At least she had the 16 years that her father served to contemplate and prepare herself for own ascension to the throne. While the methods by which a Pope is chosen or a Monarch succeeds to the throne differ, in the end they both carry the same burdens; life, in the service of others; scrutiny, by the press, the people and leaders all over the world; sacrifices, of time, of personal needs and eventually, of ones health. Most, though not all, who reach the age of 85 and 86 can barely do the normal tasks associated with everyday living. I can’t imagine having to do those tasks as well as endure the rigors of 16-hour days taking care of the business of the Vatican or Buckingham Palace. In most cases throughout history, the Popes are chosen at a point where the best years of their lives have already been spent. The passion of a young priest, the physical abilities and stamina to do mission work, the drive to get up each day and do the work that has been set before them, all begin to fade as the years advance. Pope John Paul II was chosen when he 58 and he was considered young by the standards of most chosen to wear the crown of St. Peter. His successor, Pope Benedict XVI, was 20 years older when he started his journey as Pope. While theological knowledge and wisdom tend to accompany age, the physical strength is usually no longer in step with the needs of the job. The Pope is old and the Pope is tired. He recognized that his physical strength, his mental stamina and his spiritual force was diminishing each day and while I am sure he didn’t want to be the first Pope in modern times to abdicate the papacy, he ultimately did what he felt in his heart was the right thing to do, for the good of the church and really, for the world. In doing so, he refused to allow his physical condition to be a vehicle that could ultimately damage the Church that he has given his life to. For an inmate in prison, life without parole offers only one out and that is when life ends. For the head of the Catholic Church or the monarch that rules over the British Empire, they do at least have the choice to set it aside, even if the thought of doing so is probably abhorrent to them. I wonder if it will be difficult for him to watch as a new Pope is chosen and elected and to watch life go on without him? I wonder what his thoughts will be after having held such an exalted and powerful position on the world stage to suddenly go off and live quietly for the few remaining years he likely has? However you look at it, abdication of the papacy or of a monarchy has far reaching implications and in both cases carries with it a certain stigma in the eyes of some. There are many out there who agree with my position that the Pope made a decision he knew to be in the best interests of the Church but there are likely as many out there who feel that his decision to step down was neither allowable, nor advisable. Edward VIII abdicated for personal reasons, in the prime of his life and with several decades of life still ahead of him. His decision rocked the British Empire and caused a rift in the royal family that never healed and is still a sore subject to the Queen and her contemporaries that survive. I am hopeful that history will judge Pope Benedict XVI a little more kindly that it did King Edward VIII. He agreed to take on one of the most difficult jobs in the world at the age of 78, when most men his age are on the golf course. He took on the problems of the church at a time when the church was being assaulted in many directions, including scandals within its own walls. He expended nearly eight years of his health and his time trying to ensure the Church would go on after his time was finished and he knew when he took the job that he would not have the years his predecessor had to do it all. Speaking of his predecessor, he also happened to be the one picked to fill the shoes of one of the most popular and longest-serving Popes in history, which is never easy because the expectations are so great…but then he and all of his predecessors have filled the “Shoes of the Fisherman”, in that they are the successors to St. Peter, the Apostle upon whom the Church was built. To say that they all had big shoes to fill would be an understatement. In the end, he served when asked, gave all that he had and recognized that the time had come that he could no longer give the Church what it needed. In doing so, I think he showed remarkable courage and ultimate example of the doctrine by which a Catholic priest is called…to be an example of humility and self sacrifice. In relinquishing the reigns of power and stepping aside for another, he subjected himself to an act of humility through a tremendous sacrifice. How could anyone ask more of him? For as little as my opinion is worth, I respect his decision and I wish him peace in the time he has left. Right now, out there in some country, a Cardinal Priest of the Church has been marked to be the next Pope, though only one knows who that will be and He hasn’t told us yet. Whoever it is, I respect him for taking on the burdens he will shoulder and wish him the best in all that he will do. Well thought-out post, Michael, and thank you for your insights on this momentous decision. Thank you…I thought such a “momentous occasion” deserved a footnote!